Jeffery Massey is a writer who attends college at Wright State University in Dayton, OH. Public broadcasting aficionados will be treated to the crème de la crème of fact-based docu-drama when they take a look at "Einstein Revealed", a 1996 offering from the acclaimed Nova series. Viewers will see what may be considered a ground-breaking and precedence setting exposé on the life and loves of Albert Einstein, the father of modern physics. What sets this program apart from others is its intensive attention to presentations of actual still photographs of Einstein and his family and the extensive use of computer-generated graphics and animation to illustrate the many nuances of his revolutionary theories of relativity and special relativity. A magnificent production strategy provides an actor to portray Einstein while adding crucial insights and retrospectives into the famed physicist lifestyle and thought-experiments. This two-hour video reveals sophisticated production techniques which increase the validity and authority of the rather startling revelations uncovered about Einstein as scientist, divorcee, student, Jewish activist, pacifist and rebellious loner. 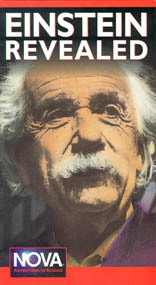 The great performance of the actor who portrayed Einstein was embellished by the authentic period costume and the use of antique-like tintype lighting whenever he performed. The use of a classical music score is supplemented by pan shots of current academic and family landscapes or buildings as the narrative voice-over provided pertinent historical, political, scientific and biographical data concerning the man who possessed greatest mind of the 20th century. Most interesting is the manner in which the the show's producers use reverse shots of a Renaissance sculpture which depicts two lovers locked in a passionate embrace. This becomes the backdrop for the intriguing story regarding Einstein's promiscuity with pretty young girls, his untrustworthiness regarding his failure to share scientific accolades with his first wife, Maeleva, and his eventual out-of-wedlock son who was afflicted with schizophrenia and died in an institution in 1966. The use of pictures during a voice-over re-enactment of his mistress and eventual second wife (cousin Eva) adds believability. The icing on the cake is the computer graphics, which provide a seriously-needed lay explanation of the great man's perception of time-space, grand unified field math and gravitational foundation for curved space. This special is light years ahead of any before it. For more information about this video, visit the PBS website.